Custom stylized logo brand for the "Foxtail" neighborhood in the Riverwood community of Nocatee, in Ponte Vedra, Florida. 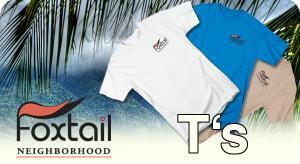 The logo is available to the Foxtail neighborhood residents printed on a wide variety of shirt garments. 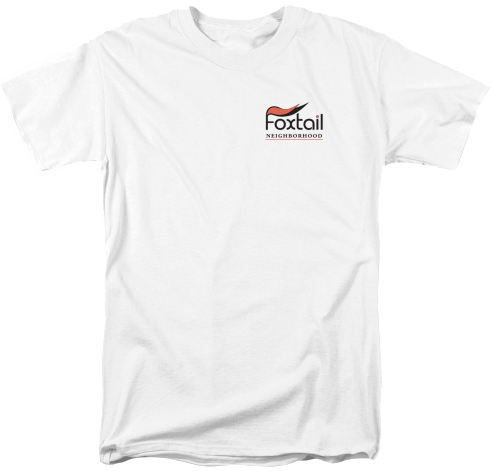 If you are interested in a shirt, go to my Foxtail logo shirt order page, where you can pick form several shirt styles and colors, then place your customized secure order. All orders are backed by a 30 day 100% money back guarantee. If you have any questions about your order, you can contact customer service any time. Thanks. My warrior medicine man painting recently sold to a collector from New Mexico. Yayyy! Click the image below to see the larger version. The larger version has a magnifier box feature allowing you to intimately view sections at 100% resolution. Please contact me if you are interested in purchasing this original. All my originals are only sold directly by me. 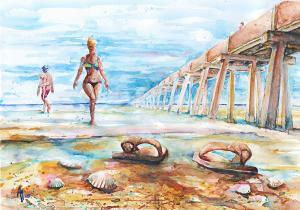 "Lost Flops" is a watercolor sketch based on my many visits to Jax Beach near my home in Ponte Vedra, Florida. Several print sizes are available now on the following surfaces- paper, canvas, acrylic, metal, and textile items. This little sketch also makes great greeting cards. My greeting cards are 5" x 7" in size and are produced on digital offset printers using 100 lb. paper stock. Each card is coated with a UV protectant on the outside surface which produces a semi-gloss finish. The inside of each card has a matte white finish and can be customized with your own message up to 500 characters in length. Each card comes with a white envelope for mailing or gift giving. Cards Ship Within 1 - 2 business days. See a larger sample of this painting by clicking on the image below. These ORIGINALS WATERCOLORS have been released for sale. If you are interested in purchasing one, please contact Arthur Fix directly by using the contact link at the top of any page on this site. Originals must be purchased DIRECTLY from Arthur Fix.